For the last two years we’ve been part of the American Express Small Business Saturday program. Unfortunately, this year Amex is not allowing web-based retailers to participate. We know that many of you have come to look forward to that promotion at this time of year, and we don’t want you to be disappointed. So here’s the deal. This week, we’re offering a 50% discount on all Oliver + S and Straight Stitch Society paper patterns. Fill your shopping bag with paper patterns and use coupon code Holiday2013 at checkout. No American Express card required! Now, for the fine print: Discount is good on paper patterns only and is not applicable on past orders. Coupon code must be used at checkout for discount to be applied. Offer expires at 11:59 PM ET on November 30, 2013. I tried your coupon. It’s giving me a discount of $30 on an order total of $80. That’s less than 50%. 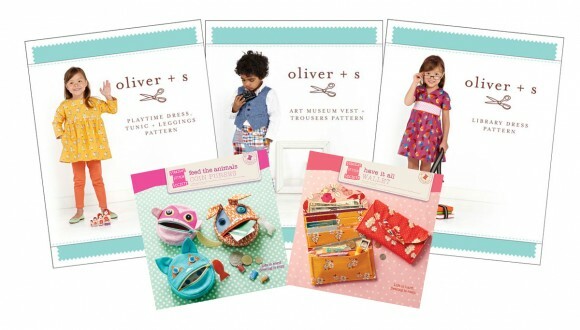 Sharon, the discount is only good on Oliver + S and Straight Stitch Society paper patterns. I’m assuming you’ve added digital patterns or other brands to your shopping bag. Joana, we run these sales every so often to help us reduce the amount of inventory on paper patterns we have in our warehouse. Keep in mind that if you use this opportunity to purchase several patterns the savings will more than make up for the shipping cost. Just wanted to add a positive comment here…50% off!! Wow! What an amazing deal, I am going to use this opportunity to finally purchase some of your patterns that I have had my eye on, thanks so much! Thank you so much for the coupon code! I picked up several patterns and can’t wait to get sewing! Wow! Best sale EVER! Thanks so much! I love it that you have sizes in both little and big. Thank you for the generous coupon! Your patterns are so lovely and it’s a treat to buy a new one, especially at 50%off! On another note, I just made the Lisette Portfolio dress and OH IT is my favorite! Happy Holidays to you! Thanks for thinking of us! I purchased several patterns that I’ve been eyeing for quite some time now, as well as two of your new releases. So excited! So happy you are doing this! For the last two years I have registered my AMEX just to get patterns from Oliver+s. While that deal was nearly free for me I’ll take the 50% as a consolation prize. The AMEX deal is not really worth my time anymore as their online business locator is worthless. Yay for 50% off! oh thanks so much! I recently ordered about 10 patterns from your ‘secret sale’. I had such a hard time picking and choosing which ones I wanted!! Now I just went back and ordered the rest of the paper patterns that I dont have! Thanks so much for such high quality patterns! I have already made about 6 things from the patterns I already have. I never buy childrens patterns from anywhere else now! BRILLIANT! I was just thinking how much I HAD to have the new patterns and wondering if I could hold out for a sale. Paper patterns are the best and this is such a generous sale. Of course, now I have to go do a stocktake as my Oliver + S pattern shelf is pretty crowded! Trying to purchase 2 oliver and s paper patterns that should have 50% off and the checkout is only giving me a dicount of about 30%? Why is this? All paper patterns are covered with the coupon code. It could be that you have a digital in your shopping bag instead. You need to use the coupon code when prompted at checkout for the discount to be applied. What perfect timing! I have been wanting to try your patterns for a while now, but money is tight. The discount pushed me over the edge, and I placed an order today. Woo hoo! What a happy way to prepare for winter and spring sewing! I, too, like to have patterns in both sizes; it is especially helpful for those of us still learning how to draft and modify patterns. Each time I sew up an Oliver + S piece, I grow as a sewist. Thank you for producing a quality product: paper, directions, variations and customer support!